With our breath spray you can get the perfect dose of freshness when you’re out and about. No alcohol, no ouch, and no worries. directions: spray + greet freely. This entry was posted in News, Newsletter, Personal Care, Product Review and tagged breath spray, hello, oral care, teeth on July 1, 2014 by Frank. Our anticavity fluoride toothpaste strengthens and whitens teeth, and reduces tartar buildup. What you'll probably notice is that it tastes incredible, and the package looks beautiful from start to finish. directions: brush + greet freely. 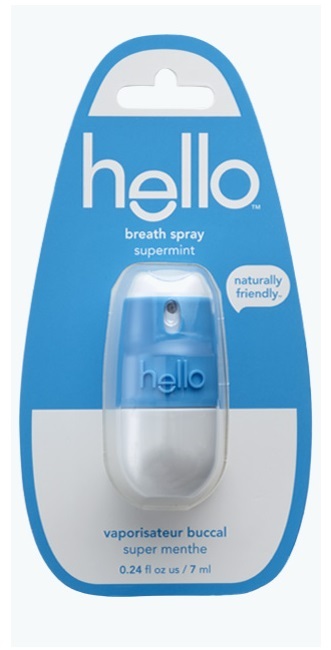 Hello is a brand of seriously friendly™ oral care products. The line currently includes a range of toothpastes, mouthwashes, and breath sprays in delicious flavors and beautiful packages, as well as a toothbrush made with biodegradable corn resin and recycled plastic. Of course! Safety and efficacy are our biggest concerns. The breath sprays and mouthwashes are all alcohol free, as well as free from artificial colors, artificial sweeteners, and dyes. The toothpaste contains the proven anticavity ingredient fluoride, and should be used as directed. Is hello tested on animals? All of our products are vegan, cruelty-free, and never tested on animals. Harbor, our head of HR, wouldn't have it any other way, and neither would the rest of us here at hello. There are no directions on the packs. How do I use hello? Mouthwash: Pour a mouthful of hello mouthwash into the cap or just take a small swig. Swish for 20-30 seconds, spitting it out when you’re done. Breathe deeply and enjoy the yummy, cool feeling that’s left behind. And don’t worry if you swallow hello mouthwash – since it has no alcohol, it won’t hurt you. Sweet. Toothpaste + Toothbrushes: Gently squeeze the paste tottle (it’s a combination of “tube” and “bottle”) from the top, putting a small amount of your favorite hello toothpaste onto your favorite hello toothbrush. Brush for about 2 minutes, getting to all surfaces of your teeth. (If you’re using the toothpaste for your kids, please follow the directions on the package.) Because of the unique shape and outer material of the paste package, we suggest you store it standing up on its cap to allow gravity to do its thing in terms of helping to get product out of the pack. Breath spray: it’s good, to go. Just twist to open, and spray once or twice into your mouth to freshen your breath whenever and wherever you want. Don’t forget to twist the colorful top again to lock the sprayer into the closed position before you put it in your pocket or purse. And be sure to share, it’s the friendly thing to do. This entry was posted in News, Newsletter, Personal Care, Product Review and tagged hello, natural, oral care, teeth, toothpaste on June 30, 2014 by Frank. The Beam Toothbrush comes with an app and provides the user with analyses of how well they take care of their teeth. It wasn’t too long ago that the world’s first entirely compostable toothbrush was covered on these pages, and now another innovation is aiming to make the everyday objects more informative. The Beam Toothbrush comes with an app and provides the user with analyses of their oral hygiene. According to the company, people take an average 46 seconds to brush their teeth. By providing a simple timer and making the process more engaging, the Beam device could go far to improving oral health. How else can everyday tasks be made more interesting? This entry was posted in Health, News, Personal Care and tagged beam, cleaning, personal care, teeth, toothbrush on October 19, 2012 by Frank. This entry was posted in Latest, Technology and tagged grill, music, play a grill, teeth on May 31, 2012 by Frank. Dentists have issued a warning about popular fruit drinks and smoothies after it emerged some can be as acidic as vinegar. Fruity drinks are commonly given to children by well-meaning parents to ensure they get their ‘five a day’. But an investigation found many contained a high acid level which can erode tooth enamel. This entry was posted in Drink Trends, Latest and tagged acid, dentist, fruit drinks, teeth on May 21, 2012 by Frank. Teenagers' love of energy drinks is taking a terrible toll on their teeth, scientists have warned. A study published in the Academy of General Dentistry charted an alarming increase in the consumption of both energy and sports drinks among young adults in the U.S. who use them to help get through the day. In some cases it can take as little as five days for the eroding effect to begin. 'Young adults consume these drinks assuming that they will improve their sports performance and energy levels and that they are 'better' for them than soda,' said lead author Dr Poonam Jain, from Southern Illinois University. This entry was posted in Drink Trends, Latest and tagged decay, dental, energy drinks, teeth on May 2, 2012 by Frank.